CruiseOne®, one of the nation’s leading home-based and military-friendly travel franchise companies, , is celebrating Military Appreciation Month this May with the launch of its third annual Operation Vetrepreneur: Become Your Own General contest, which begins on Monday, May 19, 2014 and continues until Friday, Aug. 8, 2014. Five deserving U.S. veterans will each receive a CruiseOne home-based travel franchise, a total value of $63,500. “We not only thank our veterans for performing the highest call of duty by serving our country, but we also invite them to put their military skills to use in the civilian workforce by owning a travel franchise and making vacation dreams come true,” said Debbie Fiorino, senior vice president of CruiseOne, part of World Travel Holdings. The CruiseOne franchise contest is open to former members of any of the five branches of the U.S. military (Army, Air Force, Navy, Marine Corps and Coast Guard) who are retired, off active duty and/or honorably discharged prior to the contest start date. To participate, candidates must complete an online entry form by Friday, Aug. 8. The form and all contest details can be found at www.OperationVetrepreneur.com or on CruiseOne’s Facebook page, www.Facebook.com/CruiseOneFranchise. There will be three rounds of judging as part of this contest. First, candidates will participate in a phone interview with a CruiseOne franchise development specialist. Semi-finalists will be required to submit a franchise application, business plan and resume, all of which will be scored by the CruiseOne executive team. Final candidates will be invited to participate in follow-up phone interviews before winners are selected. Five grand prize winners will be announced in August 2014. Valued at $12,700, each grand prize includes a free CruiseOne franchise with a waived $9,800 initial start-up fee and monthly service fees. The new recruits will report for active duty in October, when they participate in weeklong franchise training at CruiseOne’s state-of-the-art world headquarters in Fort Lauderdale. Winners will be reimbursed up to $500 for their travel and provided with complimentary accommodations during the training program. Once their training is completed, winners will be armed with all the tools and knowledge that they need to start up their own CruiseOne franchise. A member of VetFran, CruiseOne offers many military veteran incentive programs including a 20 percent discount off the franchise fee and additional discounts for hiring former members of the U.S. military or active-duty military spouses as associates. The company aims to have 25 percent of its travel franchise system consist of veterans and their spouses by December 2014. CruiseOne’s Vetrepreneur program will aid military veterans in finding work that will separate them from their past lives while still using the disciplinary skills they have acquired. This opportunity will enable military veterans to rise to success in the travel franchise industry while still granting them time to also relax and vacation anywhere in the world. Consistently recognized by leading industry publications as a military-friendly franchise, CruiseOne’s accolades include a number one ranking by Forbes in its “Top 10 Military Friendly Franchise,” inclusion on USA Today’s “50 Top Franchises for Military Veterans” and recognition as a “Top Veteran-Friendly Franchise” by Entrepreneur and U.S. Veterans magazines. For the past four years, CruiseOne was named to G.I. Jobs magazine’s Military Friendly Franchises® lists, which represents the top 10 percent of the nation’s franchises that are doing the most to support military veterans. Military veterans with a passion for travel and entrepreneurism who are interested in working as a CruiseOne franchise owner, visit www.OperationVetrepreneur.com or call 888-249-8235. 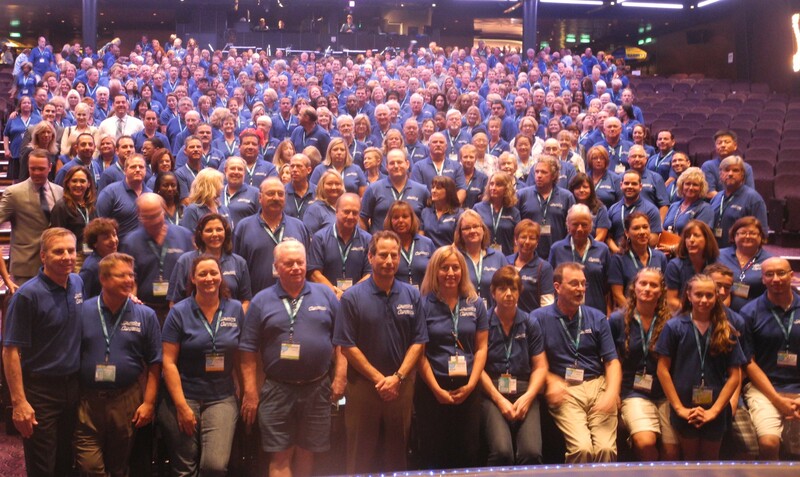 Celebrating 22 years in business, the home-based travel franchise CruiseOne® is ranked in the top one percent of all franchises worldwide and is a member of the International Franchise Association. As part of World Travel Holdings, one of the world’s largest cruise retailers, CruiseOne franchisees are able to offer their customers the lowest possible pricing on vacations with its 100 percent “Best Price and Satisfaction Guarantee.” CruiseOne has received partner of the year, a top-ranking status, by all the major cruise lines including Norwegian Cruise Line®, Royal Caribbean International®, Celebrity Cruises® and Carnival® Cruise Line. For more information on CruiseOne, visit www.CruiseOneFranchise.com; Like CruiseOne on Facebook at www.facebook.com/CruiseOneFranchise, and follow on Twitter at @CruiseOneBiz. Begins May 19, 2014 at 12:01 a.m. ET and ends August 8, 2014 at 11:59 p.m. ET. Void where prohibited by law. Must be 18 or older at the start of the Contest, have a computer and internet connection, be a legal resident of the US or DC and a former member in good standing of one of the five branches of the U.S. military who is retired, off active duty and/or was honorably discharged prior to the start date of the Contest. If selected as winners, Contestants must commit to a 5-year CruiseOne home-based franchise, which requires attendance at a 6-day New Franchisee Training Class in Ft Lauderdale, FL and a starting investment capital (for more information, go to www.cruiseonefranchise.com ; or call 888-441-2542). Only one submission per contestant. To enter, complete the online entry form available on the Facebook page (www.facebook.com/cruiseonefranchise) or on the website (www.operationvetrepreneur.com) ; If qualified and selected to move to the next round after a phone interview, Semi-Finalists must submit a résumé, CruiseOne franchise application and 1,200 words-2,200 words business plan. Submissions must comply with the Submission Guidelines in the Official Rules. Only complete, valid submissions will be accepted. Sponsored by CruiseOne, Inc., 1201 W. Cypress Creek Rd. Ste. 100, Fort Lauderdale, FL 33309. See [www.OperationVetrepreneur.com] for complete Rules and details.